September 11, 1959: The Mercury Capsule dropped in free-flight within Langley’s Spin Tunnel so researchers could observe how it gyrated and tumbled during descent. 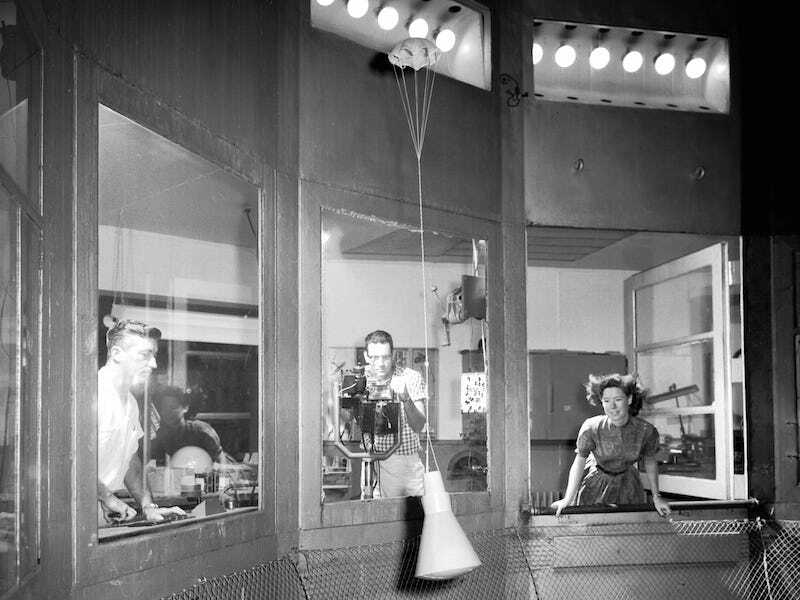 The Spin Tunnel remains in use today to study aerodynamics during unconventional maneuvers. NASA’s Langley Research Center is home to the Spin Tunnel, a chamber designed to simulate descent conditions to test scale models of planetary capsules. The chamber was built as part of escalating attempts to properly investigate the aerodynamics tailspin. The 20-foot free-fall spin tunnel replaced an earlier catapult that damaged fragile models, a 5-foot tunnel driven by an electric motor, and a shorter 15-foot free-fall spin tunnel. At the start of each test, a technician hand-launched the model into the tunnel while an operator continually tweaks airflow so the model flutters at eye level. The model’s control surfaces were shifted by clockwork into anti-spin settings, with researchers noting its spin characteristics, resistance to tumbling, and recovery from out-of-control behaviour. When the test was completed, the operator decreased the windspeed until the model gently settled into a large net covering the tunnel’s floor. Since the 20-foot spin tunnel started operations in 1941, it’s been continuously testing aircraft models. Testing included everything from simulating the sticky descent through thick atmosphere of Pioneer Venus probe in the 1970s through the countless Mars spacecraft burning through the barely-there atmosphere of the red planet. The tunnels are also used for the aerodynamics of slowing these craft down in more controlled situations, testing drogue parachute design for the Mercury capsules up to the modern Orion capsule. The tunnel is a 12-sided test chamber stretching 6 meters (20 feet) in diameter and 7.6 meters (25 feet) tall. The vertically rising airstream varies from 0 to 26 meters (85 feet) per second, driven by a 3-bladed fan powered by a 400 horsepower direct current motor. The tunnel has been used to test over 600 aircraft, spacecraft, capsules, munitions, and parachute systems.